Andy Flores Noya was born in Surabaya, East Java, 6 November 1960, Andy actually graduate engineering school. Right out of the east SD In Malang, East Java, who was born in Surabaya is go to school in the School of Engineering and the STM Jayapura. Not until graduation, he moved to Jakarta and Jakarta continued to STM 6. However, since childhood he's fallen in love with the written word. His ability to draw cartoons and caricatures of the world made him choose writing as a way of life. Therefore, so pass the STM, even got a scholarship to continue to IKIP Padang, Andy chose to sign up College Publication (now the Institute of Social and Political Jakarta). Actually, Andy was not accepted to college is because college graduates do not receive STM. But because of his determination to be a journalist is so smoldering, eventually Andy "Appeals" and met with the Rector of the College Publication Ali Mochtar Hoeta Soehoet. To the rector Andy Noya express his conscience. Finally, the chancellor gave in and provide the opportunity for Andy to take the admission test, with a record (condition), he should ask for a recommendation letter from the Director General of Higher Education. In addition, if in the future value of the course Andy ugly, he should come out. Andy turned out great achievement and college continued. Media Indonesia that they manage. So since that Andy returned to the newspaper. In 1999, RCTI in trouble. Turmoil among journalists Regarding Indonesia news program associated with the provision that requires PT Sindo, a subsidiary of Indonesia RCTI Regarding the shade, to join the RCTI as a parent. Together with senior journalists Djafar Assegaff, Andy was sent to help. Regarding the main task is to lead Indonesia as well as smooth the transition process to the RCTI. In 2000, Metro TV broadcast permission. Surya Paloh call Andy back to lead the Metro TV as editor in chief. Three years later (2003) Andy pulled back to the Media Indonesia and became chief editor of the newspaper's second largest general. Entering the year 2006, while Metro TV editor in chief Don Bosco resigned, Andy Noya, who is now a deputy general manager at Media Indonesia, requested concurrently became editor in chief of Metro TV to replace Don Bosco. At that moment Andy then began studying journalism televsisi thoroughly. He was believed to be the Host one event whose title is taken from the name itself, ie Kick Andy, a talk show broadcast by Metro TV and aired every Friday night. 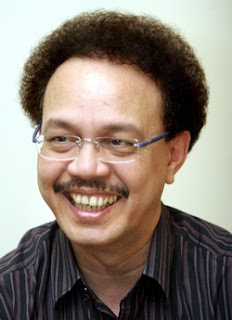 In the course of his career Andy had been a program host and Jakarta Jakarta Round Up on the First Channel Radio Trijaya for five years (1994 to 1999).